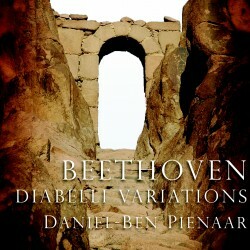 Daniel-Ben Pienaar “makes the Goldbergs sound more like that other supreme set of variations, Beethoven’s Diabelli Variations, than any other pianist has.” An appropriate observation from BBC Music Magazine, as Pienaar follows his acclaimed recording of Bach’s groundbreaking Goldbergs (AV 2235), by scaling the heights of Beethoven’s monumental 33 Variations on a waltz by Anton Diabelli. Variously called “the greatest set of variations ever written” and “the greatest of all piano works”, this late work is one of Beethoven’s most adventurous, suitably challenging for Pienaar’s technical wizardry and probing intellect. He compliments the set with Beethoven’s last great work for solo piano, the Bagatelles, Op. 126, which themselves are no mere trifles. As with his previous releases, Pienaar contributes in-depth notes which delve deeply into the music’s enigmas. Combined with his sometimes provocative, always enlightening interpretations, Pienaar has once again created a highly satisfying release.